Battle Action Force - The Complete Works- BLOOD FOR THE BARON!!! 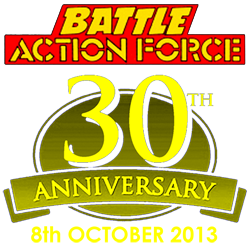 Tuesday the 8th of October marks the 30th Anniversary of Battle Action Force. As a one-off exclusive I have put together a set of printed editions. The set comprises of ten A4 250-page black and white volumes, containing the complete Battle Action Force comics collection. The strips are presented in the original running order. Please note that these will not be available anywhere else and are an exclusive only for BFTB forum members. As ever, this is a non-profit endeavour, so these will be sold at cost. The books will be made available through www.lulu.com. Please note that these covers are prototypes which have been replaced.